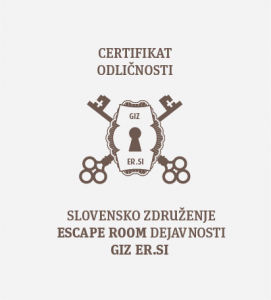 A common goal of the members of the Association GIZ ER.SI is not only to create excellent rooms and offer unforgettable experiences, but also to present Slovenia and its capital as one of the places with the best escape room games in the world. The members of the Association GIZ ER.SI will take care of continously raising the quality of our services through the exchange of knowledge, experiences, best practices and mutual promotion. In addition, we will take care of the procedures and recommendations that ensure safety in our rooms and the highest quality escape room services, from a clear presentation and a straightforward contact and reservation process, to the welcome reception of customers, and the planning, implementation and management of games, as well as the moment of “debriefing” and monitoring the responses of our satisfied customers. We strive for creating an excellent gaming experience with meaningful, diverse and logical puzzles, safe gaming devices, an interesting story and an impressive ambience. The members of the Association GIZ ER.SI are available to other members for advice and guidance, since the players will only want to return to excellent rooms. Thus, to facilitate the distinction of really excellent rooms and to contribute to the development of our field, the Association GIZ ER.SI will annually award a Certificate of Excellence, which also aids players in selecting a room and reduces their risk. Member Rules and Guidelines (coming soon).